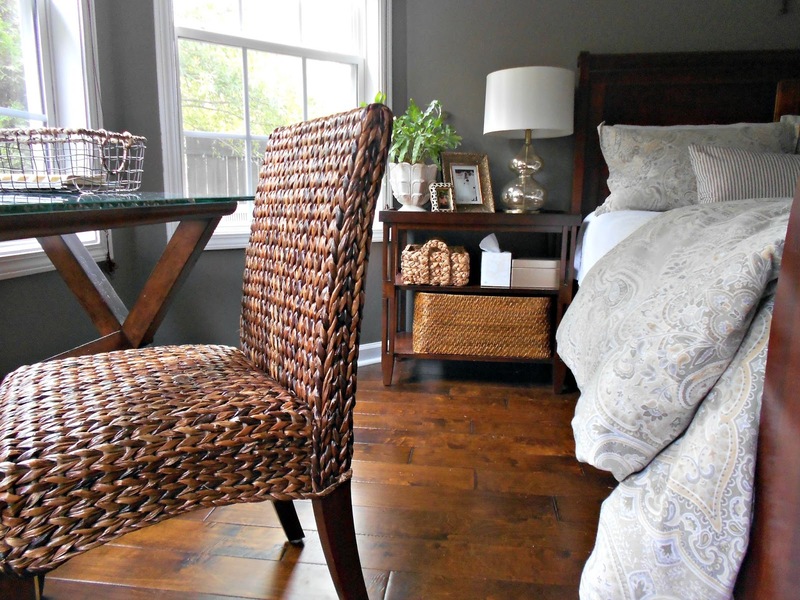 Entering the Fall 2015 One Room Challenge-The Master Bedroom - Oak House Design Co. I found out this weekend that the One Room Challenge hosted by Calling It Home began on Wednesday. I have loved following along with room renovations by several of my favorite bloggers in the past, and have wanted to link up, but never have. But since I have been talking about a redo of my master bedroom, and I have a tentative plan drawn up, I think I will dip my feet in the water this fall. It's about time I crossed this project off my list! If you're unfamiliar with the One Room Challenge, it's a six-week long room makever challenge, where 20 different invited bloggers post progress on their room makeovers with the goal of having them completed in six weeks. Other bloggers like me can link up and work on a space as well. It can be a boost to finish because you're all working toward a common goal. I posted about my master bedroom last week and shared my design board. So this will serve as my inspiration and starting point. I mentioned before that I had ideas for money-saving hacks and DIY's. They include the seafan artwork, the nightstands, sewing custom drapery, and the building the shelving unit. It may be a bit ambitious to complete the custom built-in unit within the six weeks, so I haven't decided if I will attempt it. The bed I already have, I just need to take down my current one and set-up the new one. I know how to sew custom draperies, but tend to dread the process, haha! So hopefully the challenge will get me motivated. I may also add more fall color because I have ideas for that as well. But this is a start. Here are a few more pics of the space as it its now, which isn't horrible by any means. The room actually has quite a few positives, like the vaulted ceilings, huge bay window, and great natural light. The furniture set is what my husband and I bought when we first got married and thought we were grown! You know the sets where they only sell you one night stand?! Once I painted and replaced the flooring last year, it made a huge difference because it complemented the cherry wood tones so much better than my previous paint color. If you have this wood tone, I highly recommend the color Slate by Restoration Hardware. I added the side table and desk last year. The side table was a Ballard Designs outlet find that I stole from my sunroom. And the desk and chair are from an amazing craigslist score for $60. I also 'borrowed' them from my sunroom. I tend to play musical furniture! I am thinking of replacing this dresser with the black one I have behind the sofa in the family room and moving it to the wall that currently has the armoire. This beast of an armoire, which we had in our first apartment, used to house our tv. But since we have a flatscreen, we no longer use it for that, but do use it for storage. The goal of the built-in is to replace that storage. Now I am thinking, where are we going to put this? I may have to post it on Craigslist. I am thinking of putting the dresser on this wall and the built-ins on the wall facing the bed. This picture doesn't have great lighting, but I wanted to give you an idea of the bay window. 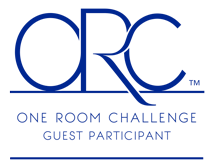 Overall, I am excited to finally be a linking participant for the One Room Challenge! The 20 invited participants will be posting their progress on Wednesdays, and us linking participants will link up on Thursdays to share our progress. Yikes, I already feel like I am in a bit over my head! But I will be posting progress on Instagram @oakhousedesignco as well, so be sure to follow along! Love your floors. Looking forward to following along! Thank-you, Brenda! Hope I can keep up!